I have a confession to make… I cannot call this attraction by its real name. The water park is within uShaka Marine World (the giant aquarium and water park that sit on Durban’s beachfront), and the old water park used to be called Waterworld, so I’ve just stuck to the old name. Why? Because these days it is called (wait for it) Wet n Wild, and I thought if I wrote a review of something called Wet n Wild, Google would classify my interests a little differently. So let’s just pretend it’s called Waterworld, shall we? And now I can tell you how much fun it is – because it is So. Much. Fun. I kid you not! Last time I was in Durban, I dragged my friends along to Waterworld for the day, and I was half-expecting it to be a little lame. You know how fun waterslides and tube races and steep watery drops used to be when we were kids, but surely, surely it’s not that fun any more? Surely. Well! I was wrong. It is, if anything, even more fun, because now there’s an element of fearlessness to racing down the slides – if the kids can do it, surely adults can too? 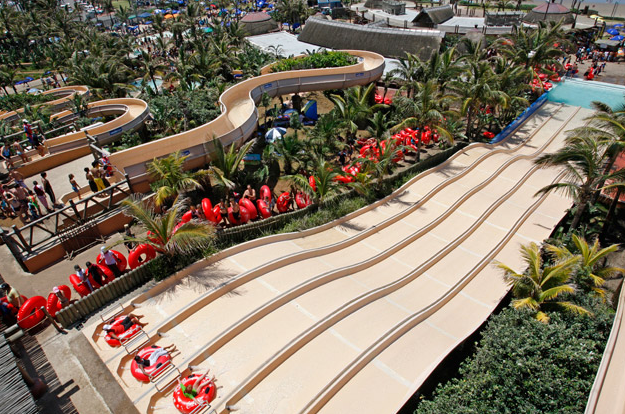 There are tube races and a long meandering river ride that goes past the shark tank, spraying you with unexpected jets of water en route, and there are steeply dropping rides and races and even the Drop Zone, Africa’s highest slide. But there are also more relaxed tubes, and loads of places to swim, or lie in the sun and bask, or eat hot chips and drink cooldrinks (a must for any Waterworld excursion!) It is, in fact, a simply fabulous day full of fun and adventure – the kind you don’t often get as an adult. Even from a place called Wet n Wild! I’m afraid we do not assist with quotes for this. Best you contact the Durban tourism board or Marine World direct to get a quote. Here are the costs of tickets from the Wet ‘n Wild website (August 31, 2012) – although I have not been myself I have been told it is well worth getting a combined ticket to Sea World as well.